Leo Messi scored a decisive goal in the dying minutes of the match against Villarreal on Sunday, his 40th official goal this season. Not even the player’s struggle with injuries in the first half of the season stopped him from netting jaw-dropping amount of goals. So far this year, he’s scored 40 goals from 43 matches played – here’s the breakdown of goals per competition: 27 in the league, 8 in the Champions League and 5 in the Cup. The only competition he’s failed to score in this season is the Spanish Super Cup. There are three more league games on the calendar. 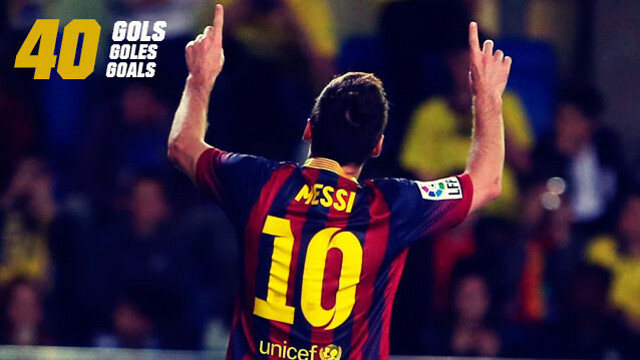 This is the fifth consecutive season in which Messi has soared 40 or more goals. In the 2012/13 season he scored 60 goals, in the 2011/12 season he netted 73, in the 2010/11 he scored 53 and in the 2009/10 he scored 47. In that time period he’s claimed the Pichichi award and the Golden Boot three times.